This CellML model runs in OpenCell and COR and reproduce the published results. The units have been checked and they are consistent. ABSTRACT: The hypothesis that calcium release from the sarcoplasmic reticulum in cardiac muscle is induced by rises in free cytosolic calcium (Fabiato 1983, Am. J. Physiol 245) allows the possibility that the release could be at least partly regenerative. There would then be a non-linear relation between calcium current and calcium release. We have investigated this possibility in a single-cell version of the rabbit-atrial model developed by Hilgemann & Noble (1987, Proc. R. Soc. Lond. B 230). The model predicts different voltage ranges of activation for calcium-dependent processes (like the sodium-calcium exchange current, contraction or Fura-2 signals) and the calcium current, in agreement with the experimental results obtained by Earm et al. (1990, Proc. R. Soc. Lond. B 240) on exchange current tails, Cannell et al. (1987, Science, Wash. 238) by using Fura-2 signals, and Fedida et al. (1987, J. Physiol., Lond. 385) and Talo et al. (1988, Biology of isolated adult cardiac myocytes) by using contraction. However, when the Fura-2 concentration is sufficiently high (greater than 200 microM) the activation ranges become very similar as the buffering properties of Fura-2 are sufficient to remove the regenerative effect. 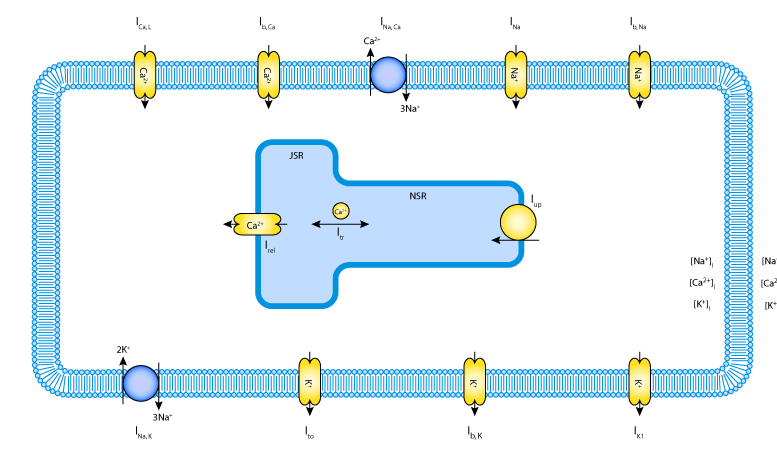 It is therefore important to allow for the buffering properties of calcium indicators when investigating the correlation between calcium current and calcium release. A schematic representation of the Earm and Noble 1990 model. Derived from workspace Earm, Noble, 1990 at changeset 0f4051afdbdd.